The July/August Issue Is Out! 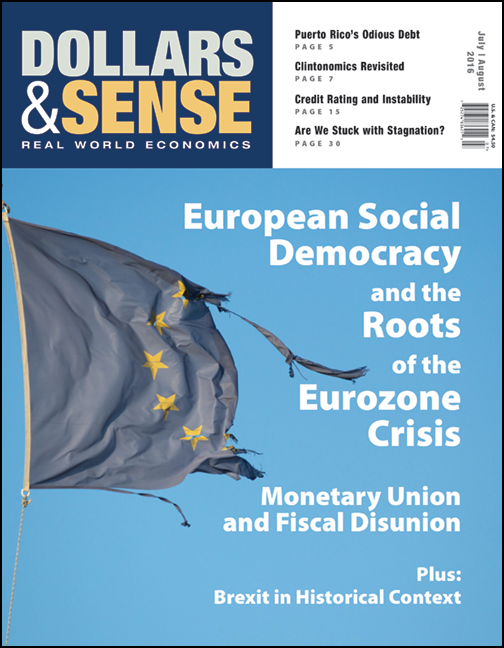 The July/August issue of Dollars & Sense is out! We fell a bit behind because of our recent office move. But the issue has now been sent out to e-subscribers and the print edition is at the printers. We have posted three articles from the issue online already: Josean Laguarta Ramírez’s Enforcement of Puerto Rico’s Colonial Debt Pushes Out Young Workers, John Miller’s A Clintonomics Sequel, and Alejandro Reuss’s An Historical Perspective on Brexit. Life in capitalist society, in “ordinary” times, is no picnic. It’s more like a fish fry—and we’re the ones in the pan. Rob Larson, in the second part of his study of the economics of information, shows the relentlessness of capitalist corporations in controlling the information we see about them, in a range of arenas: from advertising, to corporate public relations, to influence over the organizations—mass media and credit rating agencies—that are supposed to render independent judgment of them. Of course, these are not ordinary times, and all of the contradictions and outrages of capitalist society are amplified. José A. Laguarta Ramírez’s article about Puerto Rico’s debt crisis points to its roots in colonialism. Subordinate to the U.S. government politically and to U.S. corporations economically, Puerto Rico is now mired in “odious debt”—neither incurred freely by its people nor used for their benefit. Meanwhile, legislation just passed by the U.S. government will impose harsh austerity and an undemocratic “oversight” board. Laguarta Ramírez suggests that the solution to the crisis lies in the direction of repudiating the debt, which in turn points in the direction of political independence. D&S co-editor Alejandro Reuss looks at the eurozone crisis. The structure of the monetary union deprived member countries of the means to respond individually, and did not institutionalize ways to respond collectively (like automatic fiscal transfers to the hardest-hit areas). This faulty structure, Reuss argues, was not just an accident, but a result of the long-range neoliberal turn of economic policymaking in Europe—in which the mainstream social democratic parties are seriously implicated. The most recent twist, the UK’s “Brexit” referendum, is a nationalist and nativist reaction to the crisis of internationalized capitalism—to which the left must answer with a new socialist internationalism. Arthur MacEwan addresses the question of whether we’re staring into an abyss of long-term economic stagnation. There are good reasons, he notes, to think of economic stagnation as an inherent problem in capitalist economies, rooted in “over-accumulation”: Profit-making in one period gives capitalist enterprises the means invest in expanded plant and equipment, and the expanded capacity means more goods and services can be produced—sometimes more than people are able and willing to buy. MacEwan, however, also points to more particular causes of the current stagnation, and argues that a solution requires government policies to reduce inequality, maintain demand and employment, and invest in new infrastructure. With each new piece of news—the Puerto Rico debt crisis, the Brexit vote, the victories of the right in Latin America and Europe—it seems like we’re going from the frying pan into the fire. But consider each of the problems described above—the chronic and the acute. For each, there are solutions, and it comes to us to organize and fight for them. Yes, we’re going into the fire. But what will emerge from the flames?